All of the auto insurance Big 4 grew market share last year — and most of the others in the top 25 lost it last year, based on a comparision with preliminary 2014 data released this month by the National Association of Insurance Commissioners with the 2013 tallies. The NAIC Top 25 includes information from more than 97 percent of the insurance market. Now it’s possible that the numbers will change — NAIC is planning on updating them each Monday this month and then possibly again later this year for a final report — but the preliminary data is certainly interesting. The Big 4 — State Farm, Geico, Allstate and Progressive, in that order — now control about 48.38 percent of the market, up more than a percentage point from the approximately 47.11 percent they held in 2013. And of the six in Nos. 5-25 who didn’t lose share, two stayed flat (No. 12 Auto Club Enterprises, which is one of the two major AAA car insurance wings, and No. 17 Auto-Owners), and one (No. 7 Liberty Mutual) grew share by less than a percentage point. 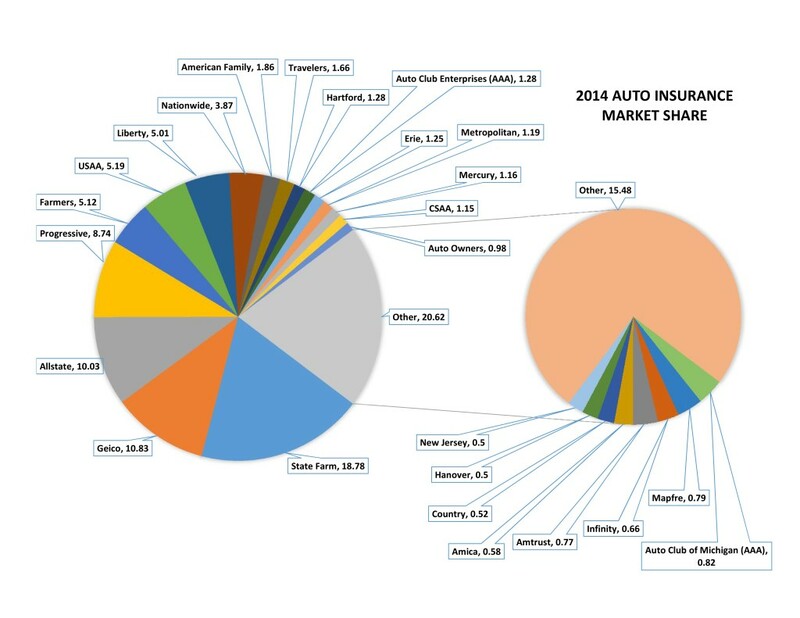 This image shows market share estimates for some of the top insurers in 2014 from NAIC March 9 estimates. USAA overtook it to become the new No. 5 auto insurer with 5.19 percent of the market, up from 5.04 percent. No. 6 Farmers fell 0.31 percentage points, from 5.43 percent of the market to 5.12 percent in what was the largest proportional decline of all 25 insurers: 5.71 percent. Side note: As the Farmers example indicates, the numbers can get a little confusing when we’re talking about a percentage decline of a market share percentage. For the rest of this article, when we talk about percentages lost or gained, we’ll be referring to proportions, not how many percentage points a company lost. Certainly, there are disadvantages to concentrating solely on market share. What good is being No. 1 if you’re up to your eyeballs in debt or you’re No. 1 in a dying industry? But locking up more of the market might matter more for insurers than other businesses, and not just for the obvious factors like a bigger revenue base and bragging rights. Insurers with big auto business can entice those customers into bundling with other more lucrative products like life insurance. Progressive recently indicated that would be a company focus. And every customer added who hasn’t filed a claim is giving an insurer an interest-free loan they can grow through investing. 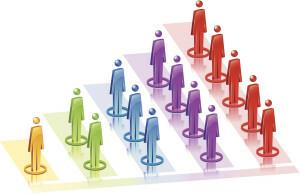 For collision repairers, higher insurer market share can mean a couple of things. One, as insurance players get bigger, they can set the tone for the industry in terms of body shop relations — possibly to the detriment of the shop, as auto body shops have alleged about No. 1 State Farm. It also means that insurers losing customers might get more aggressive with rates, which could lead to consumers dropping collision to get a bare-bones “lowest” rate, or what they’re willing to pay out in claims — or both — to preserve their balance sheets. Or they throw in the towel and quit the auto insurance business for more lucrative underwriting, in which case the major players could swoop in for the scraps and get even bigger. Here’s some other interesting tidbits from the market share information. AAA combined — which includes No. 12 Auto Club Enterprises and No. 18 Automobile Club of Michigan — lost 1.87 percent of its market share. If the two were considered a single company, it’d be No. 9. Infinity fell 4.35 percent and was the only other insurers to drop in the rankings, falling below No. 21 Amtrust to No. 22. Allstate showed the lowest growth of the Big 4, just 0.91 percent. State Farm rose 1.62 percent. Geico, which beat Allstate out for No. 2 a couple of years ago, rose 5.76 percent, the largest growth among any of the top 10 insurers. Progressive was next, growing 3.43 percent. The biggest winner was Amtrust, at 16.67 percent growth, but it only controls 0.77 percent of the market and so the gain appears more dramatic than it probably is. After Farmers, the next major loser was No. 10 Travelers, which fell 5.14 percent. Correction: We’ve corrected an erroneous pie chart that was posted earlier with the more accurate one below.